Welcome to Blue Sky Spectroscopy Inc.
We also produce single pixel or imaging spectroscopic solutions at mid- and near-infrared wavelengths. We provide complete system engineering from optical, mechanical and electronic design through to manufacture, assembly, integration and verification of state of the art instrumentation. All systems are developed under tight project management and include extensive documentation and test data. 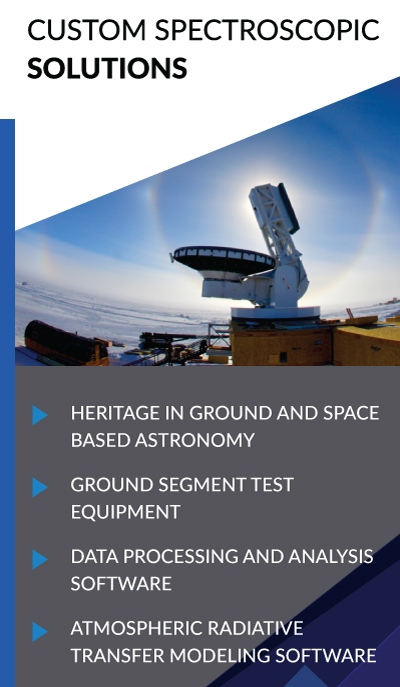 Examples include systems for the South Pole Telescope and Max Planck Institute. Blue Sky has developed sophisticated data processing and scientific analysis software for space astronomy missions. The code meets ESA’s stringent high quality assurance standards with regards to design, documentation and validation. We provide custom development of single-pixel or imaging spectrometers from the visible to the far-infrared. We also manufacture narrow band infrared radiometers. These systems are complemented by our radiative transfer model which simulates transmission through and emission from the atmosphere and gases. Please browse through our listing of products and capabilities, and contact us with your custom infrared instrumentation requirements. Blue Sky Spectroscopy is proud to host the Data Analysis and Processing Centre for the SPIRE imaging Fourier transform spectrometer. SPIRE is one of three scientific payload instruments on the European Space Agency’s Herschel mission, a far-infrared and submillimetre space observatory. The Canadian Space Agency provides ongoing funding for a technical Canadian contribution to Herschel/SPIRE.